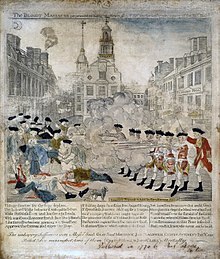 The Boston Massacre happened when five civilians (people who were not in the military) were shot and killed by British troops on March 5, 1770. It was in Boston, Massachusetts, which was a British colony at the time. The event happened at night when a large mob got together outside of the Custom House. One British soldier named Hugh White had hit a boy who had insulted his commanding officer. The boy ran away and came back with a large mob of angry people. More British soldiers came to help protect Hugh White from the people. The mob threw snowballs with clams inside them. As the mob got larger and larger the scene became more and more chaotic. Someone in the crowd yelled "fire". In the confusion, some of the soldiers fired into the crowd. Crispus Attucks, an African-American man, was one of the first people killed. Eight British soldiers went to court after the Boston Massacre. Only two of them, Hugh Montgomery and Matthew Killroy, were found guilty of manslaughter in court. Their punishment was to have their thumbs branded (have their thumbs marked with a burn). John Adams was the lawyer who defended the British soldiers. He knew that many people would be upset with him for defending the soldiers, but he believed that everybody deserved a fair trial. (Adams would later become the President of the United States). 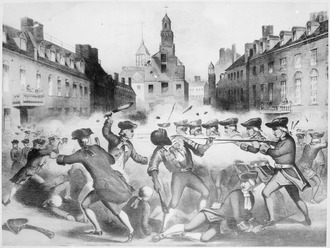 Paul Revere, a man who worked with metals in Boston, made an engraving of the British soldiers shooting into the crowd. Many people saw the engraving and became angry. A few years later, the American Revolution started, and the colonies would become an independent country, the United States of America. Lithograph from 1856 focusing on Crispus Attucks, who had by then become an important symbol for abolitionists. ↑ "Boston Massacre". Boston Massacre Historical Society. Retrieved March 3, 2010. ↑ "Africans in America/Part 2/Crispus Attucks". pbs.org. Retrieved November 17, 2010. ↑ O’Connor, Thomas H. (March 16, 2001). The Hub: Boston Past and Present. Northeastern. p. 56. ISBN 978-1555534745. This page was last changed on 27 March 2019, at 22:10.